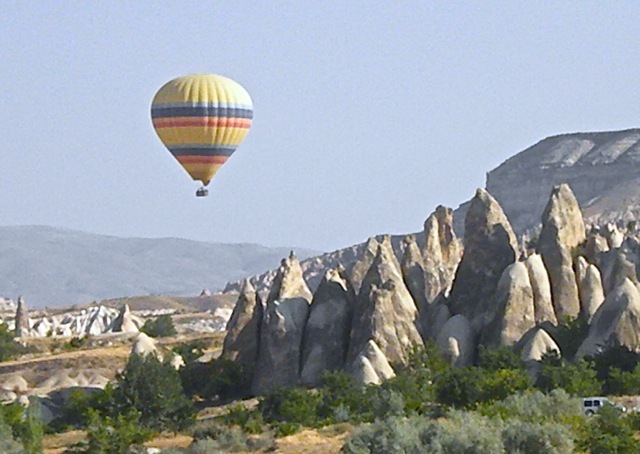 On the morning when we visited the cave houses of Cappadocia in Turkey, we saw this colorful hot air balloon float by. Our friends who did ride the balloon raved about the scenery they saw from the sky. We would definitely take the ride if we had the opportunity again. 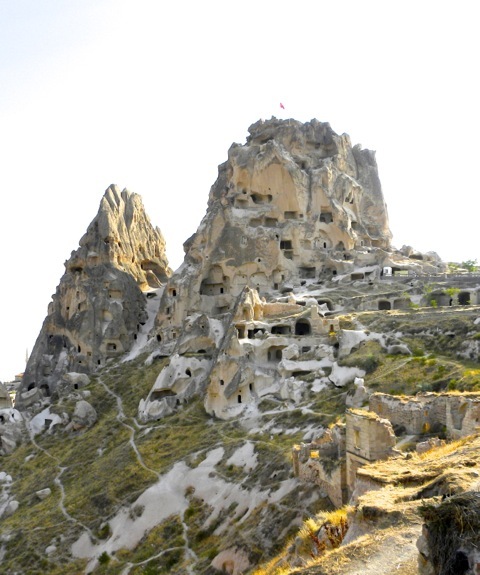 Cappadocia is famed for its cave houses built into rocks for thousands of years. They are comfortable dwelling as they are warmer in winter and cooler in summer. 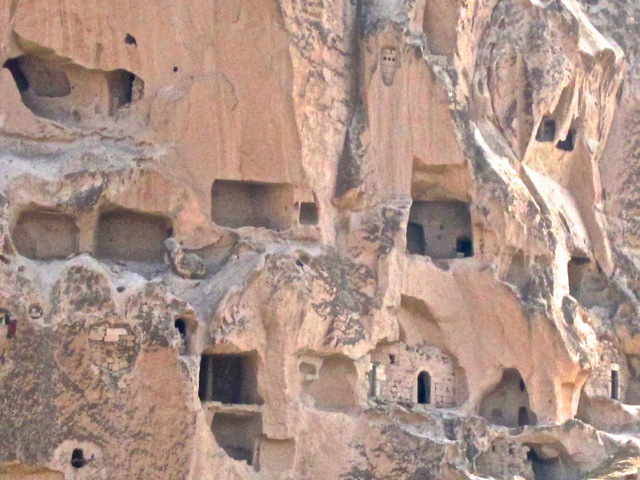 In some towns, residents still live in houses built adjacent to caves. 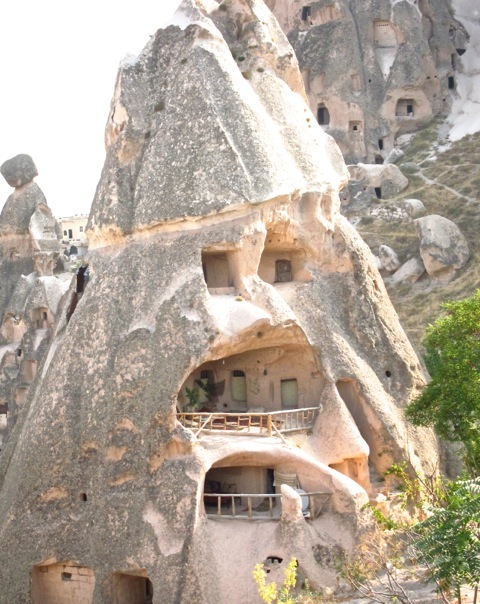 Some hotels have been established in caves so tourists can experience living in such dwellings. Two dwellings with balconies are very inviting. These used to be interior rooms of cave houses where people lived. In time, the rocks eroded and slabs fell off, exposing these rooms to sunlight. One cave church was exposed to the elements when its rock collapsed. The interior chapel, alcoves and vaulted ceilings are plainly visible. 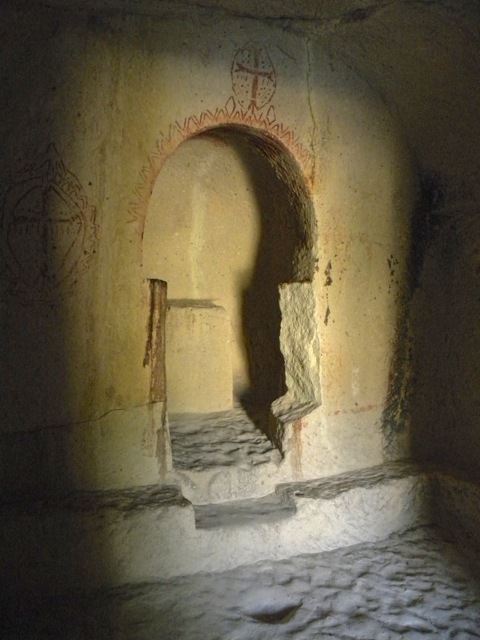 This was an alcove of a cave church. This long stone table could seat dozens of diners. 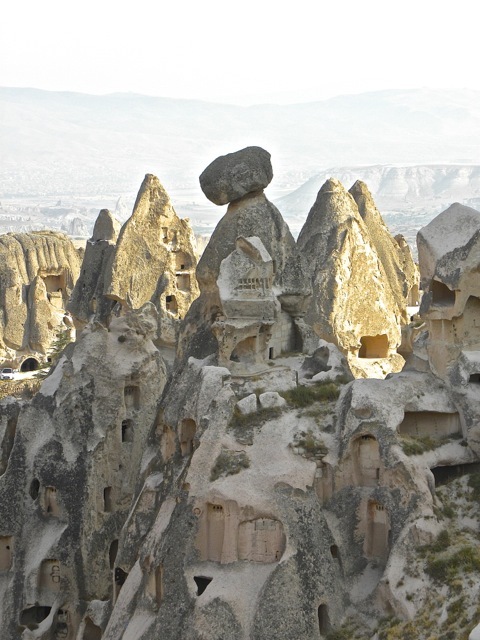 Cappadocia is honeycombed with caves carved into rocks named tufa. 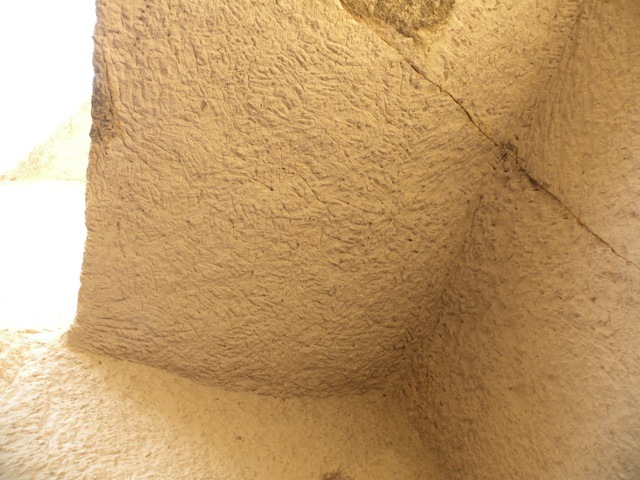 Tufa is compacted volcanic ash, relatively soft and easily crumbled in the hand. Tufa is easily carved. A dwelling for a family is said to take one day for two men to chisel out. Water would seep into the compacted volcanic ash to loosen and erode it. The slab of rock in this picture is ready to fall. As tourists are allowed to walk by it, I guess the authorities have deem it to be safe for awhile. When rocks peel off, they reveal more interior rooms. 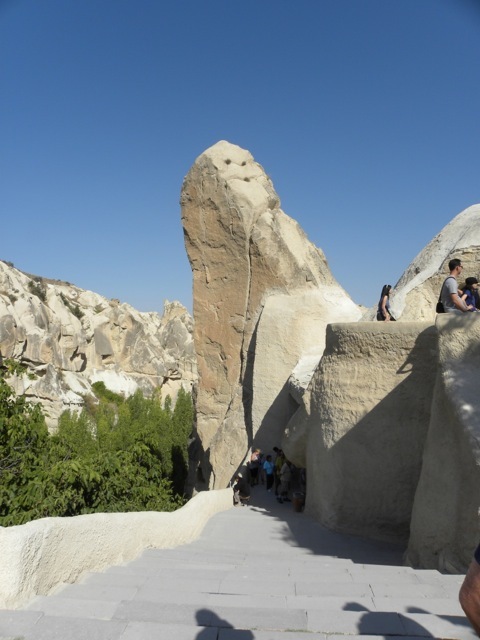 Repeated rockfalls shape the conical mounds of Cappadocia. This rock fell recently and awaits removal by the maintenance crew. To reduce erosion, the authorities cover rock surfaces with sprayed concrete. The white concrete contrasts against the grey natural rock. 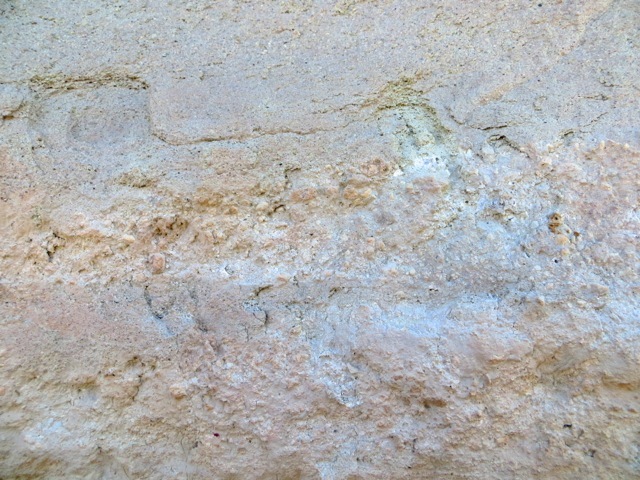 The thin layer of sprayed concrete suffers from weathering. In time, it crumbles and peels off to expose the rock underneath. 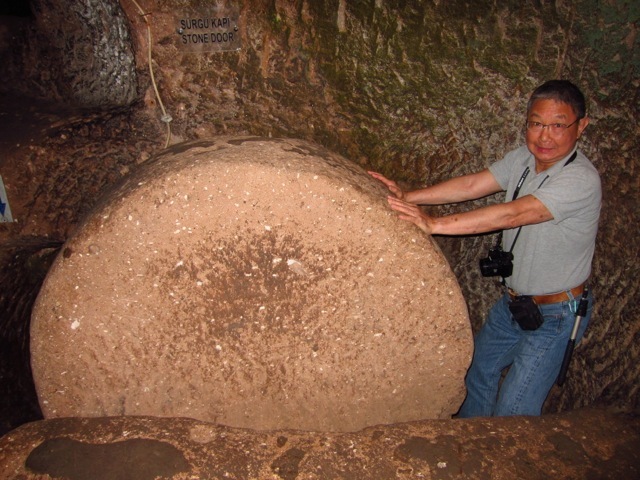 This rock teetering on a tufa cone is the reason for this area to be cleared of residents. 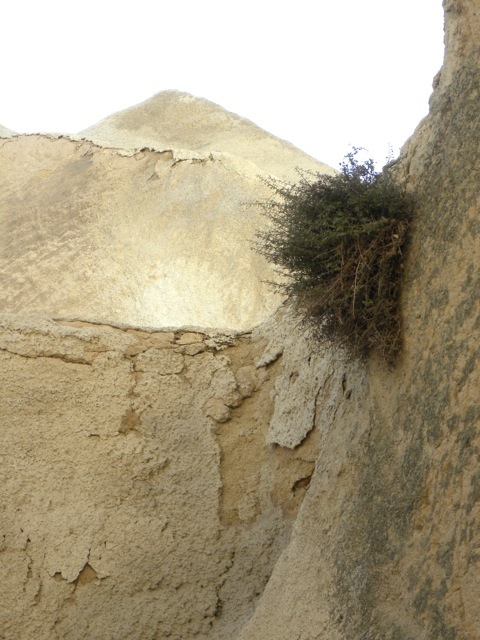 As the tufa cone underneath erodes, eventually the rock will lose its support and tumble down. 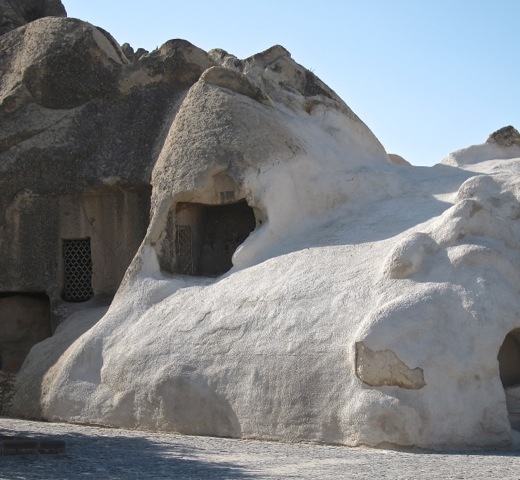 Where it is safe for habituation, caves are still being used. This small cone houses a one-room police station. This mound used to house a fort on a single rock. The middle section eroded and one rock became two. A flag of Turkey still flies on the peak of the disused fort. 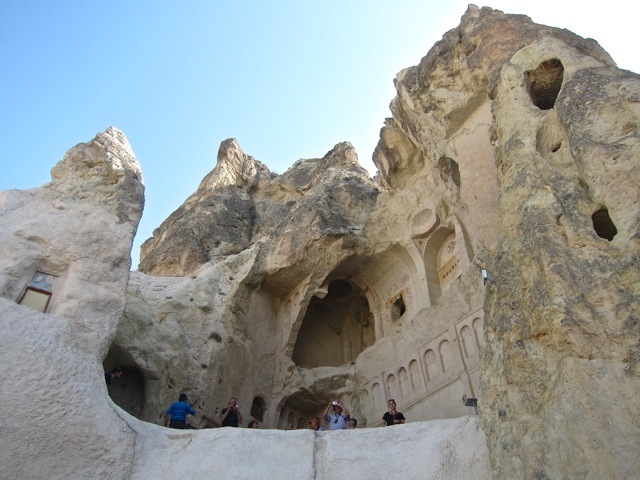 Cappadocia also housed people in caves underground. 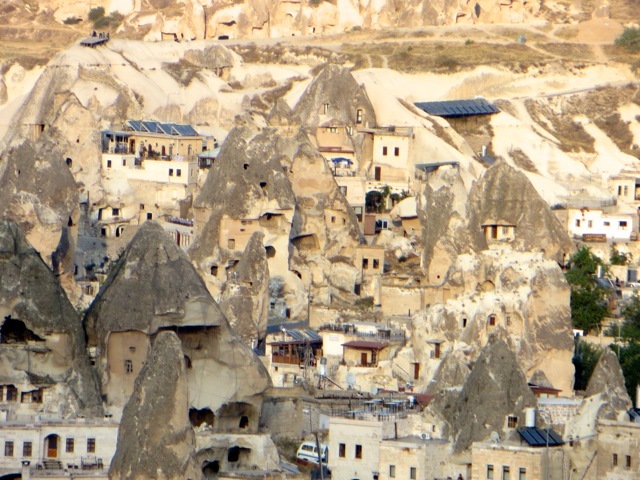 These underground cities were dug many centuries ago as temporary refuge from invaders and are no longer used. 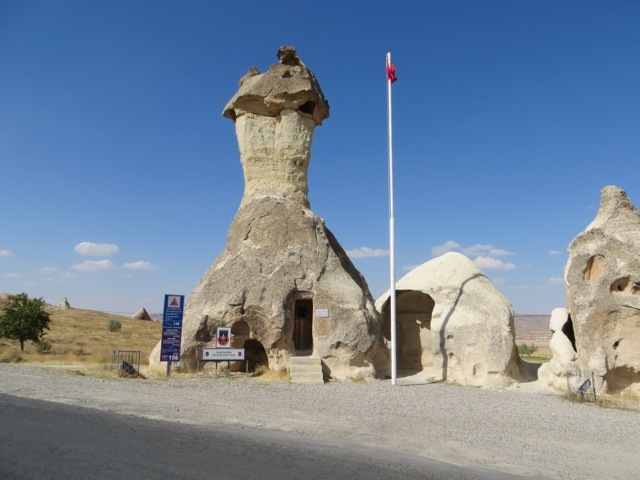 There are at least 40 underground cities in this region, but nobody knows for sure how many there are. 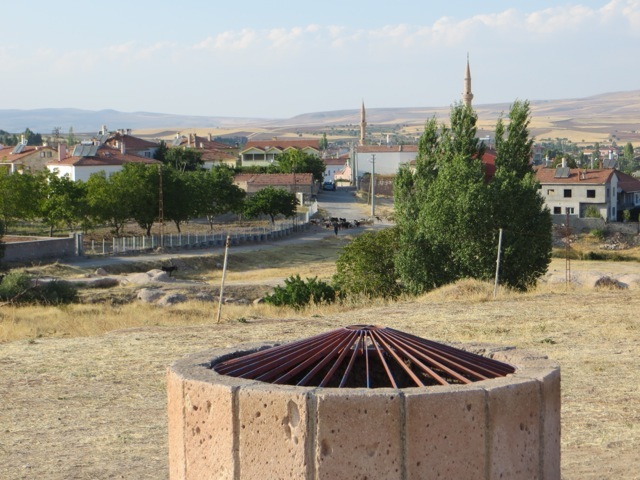 One of the underground cities is Ozkonak which lies under this piece of land. It stretches from this vent to the far minaret. I estimate it to be about three hundred yards long. 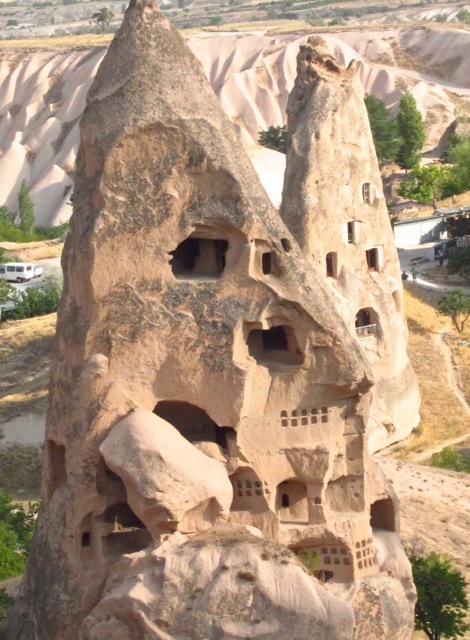 It has 10 levels of rooms and passages that reach 130 feet underground. It is estimated to be capable of housing 60,000 people, but I find this number to be unbelievable. With so many people living underground, it was inevitable that some would die. The deceased were temporarily interred in vaults such as this one until it was safe to go above ground again. 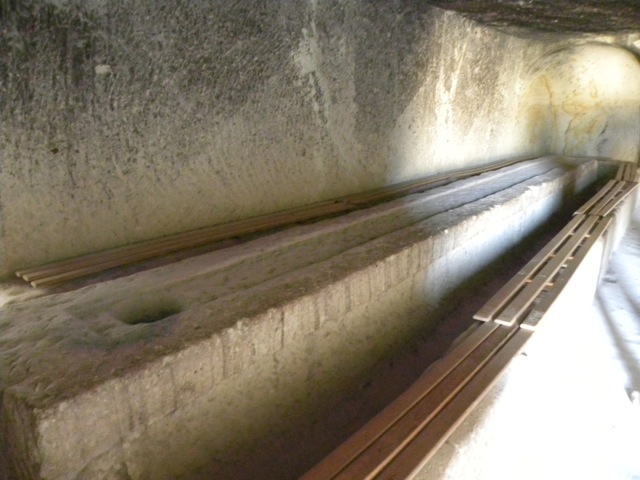 Tunnels are narrow and twisty. Any invader would easily get lost in this labyrinth. 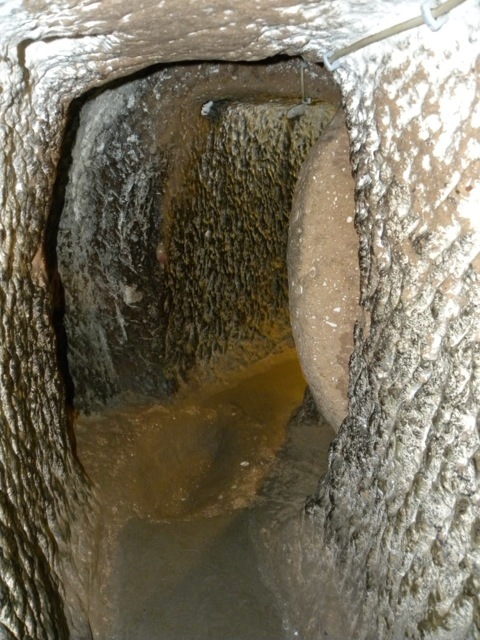 Some passages are protected by round stone doors, carved into the portal and its trough. 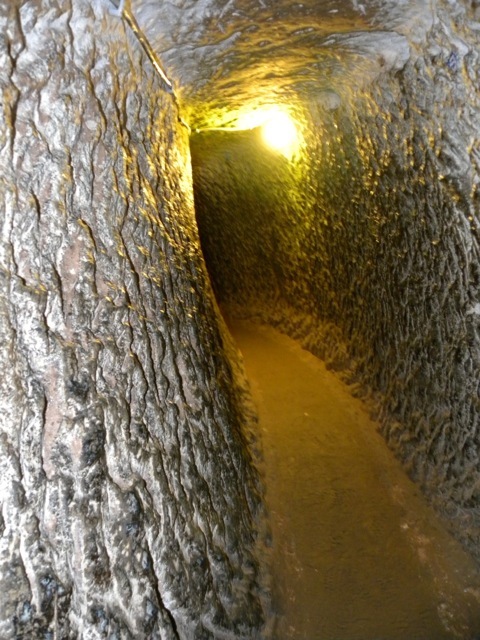 Parallel tunnels above these passages allowed defenders to pour hot oil onto invaders. A system of such tunnels and stone doors could trap and eliminate invaders foolish enough to enter this city. 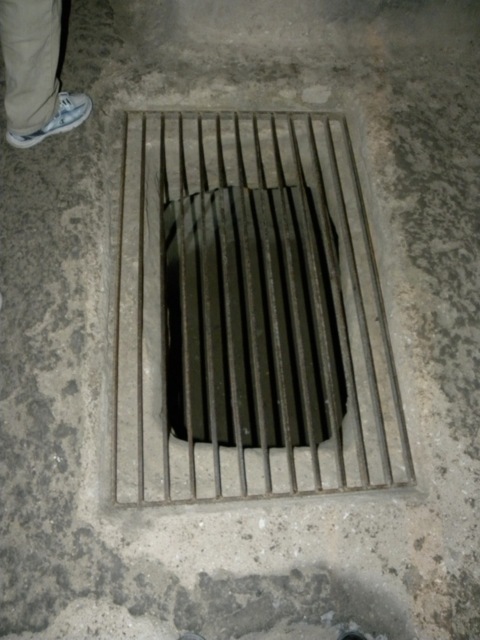 When necessary, the heavy round stone door can be rolled in its trough and block the tunnel. I can push the stone door and seal off the tunnel. Posted by Robert Wu on Thursday, December 20, 2012, at 8:17 pm. Filed under Uncategorized. Follow any responses to this post with its comments RSS feed. You can post a comment or trackback from your blog.